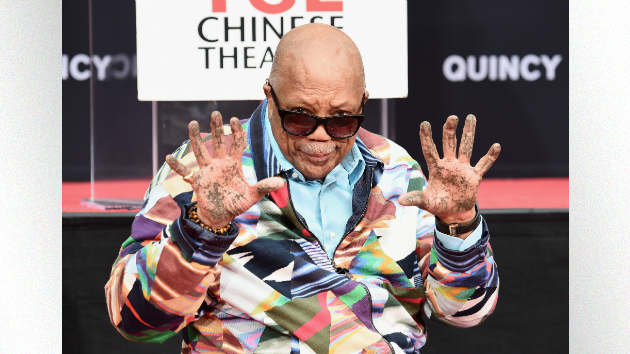 Quincy Jones received a special honor in Hollywood today, as the legendary producer and composer placed his hands and footprints in cement at the historic TCL Chinese Theatre. The 27-time Grammy winner was recognized for his lifetime achievement in entertainment, and is the first composer to be so honored. At the ceremony, he recalled how he became the first black composer in Hollywood. R&B star Usher and hip-hop legend Snoop Dogg were on hand to help honor Quincy. Snoop Dogg also praised Jones. Jones is one of only 18 EGOT winners, having won an Emmy, Grammy, Oscar and Tony. His production credits include one of the best-selling singles of all time, “We Are the World,” and Michael Jackson‘s iconic albums Thriller, Bad and Off the Wall. A two-hour BET special honoring Jones called Q85: A Musical Celebration for Quincy Jones will air December 9. It will feature such stars as Stevie Wonder, Oprah Winfrey and John Legend.